Leader of the National League for Democracy party (NLD) and Myanmar's new foreign minister, Aung San Suu Kyi, shakes hands with Chinese Foreign Minister Wang Yi, left in Naypyitaw, Myanmar, April 5, 2016. Long-term relationship will hinge on how the new civilian government addresses concerns raised by China regarding border security and business disagreements. The friendly handshake between Myanmar Foreign Minister Aung San Suu Kyi and her Chinese counterpart Want Yi in the capital city of Naypyitaw this week is being portrayed in China as a “good beginning” for Sino-Myanmar ties. But the neighbors’ long-term relationship will hinge on how the new civilian government addresses concerns raised by China regarding border security and business disagreements. Analysts say given Myanmar’s economic dependence on China it will be a high call for the new government, led by Aung San Suu Kyi who is seen as a trump card for the West, to contain the superpower neighbor’s growing influence in Myanmar. Yet China will have to make compromises to resolve its business spats with Myanmar, they add. During his two-day official visit to Myanmar, China’s Wang had extended an olive branch. "I've come to send out a very clear signal to the international community that China is pleased to stand by Myanmar and continue to be a good neighbor, a good friend and a good partner of Myanmar, after it has turned over a new page in its annals," Wang told Aung San Suu Kyi during their meeting on Tuesday. Chinese Foreign Minister Wang Yi gestures during a press conference after meeting Myanmar's new Foreign Minister Aung San Suu Kyi, leader of the National League for Democracy party (NLD), in Naypyitaw, Myanmar, April 5, 2016. Wang's visit ensured that China’s formerly close ties with Myanmar's military predecessors will continue with the new civilian government now in place. He also expressed confidence in resolving business disagreements with Myanmar through consultations, while vowing to guide Chinese enterprises in being more socially responsible there. Ending his visit on a positive note, Wang further told Myanmar’s Armed Forces commander-in-chief, Min Aung Hlaing, on Wednesday that China is committed to working with Myanmar in safeguarding peace and stability along their shared border. 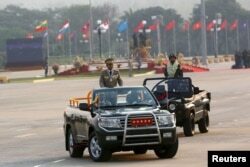 Commander-in-chief Min Aung Hlaing rides on a vehicle during a parade to mark Armed Forces Day in Myanmar's capital Naypyitaw, March 27, 2016. 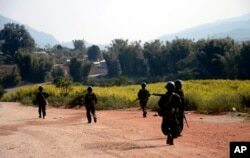 On China’s policy agenda, the long-simmering tensions between the central government in Myanmar and ethnic militias in the northern border region near Yunnan province has a direct impact on China’s security and its bilateral relations with Myanmar. So does the two countries’ disagreement over controversial Chinese investments in Myanmar including but not limited to the $3.6 billion Myitsone mega-dam project, which was unilaterally suspended by Myanmar in 2011. China counts on the new civilian government to come up with resolutions for both issues soon. By inviting Wang to be her first visiting dignitary from abroad, Aung San Suu Kyi cleared doubts about the trajectory of Myanmar’s future ties with China although she failed to commit to a quick solution to the Myitson dam controversy. “We want to cooperate peacefully with the world. We will cooperate for peace and human development," she told Wang during a joint news conference. That suggests that the new leader is seeking to keep a neutral stance in Myanmar's bilateral relations with China and other western allies, most notably with the United States, said Jonathan Chow, assistant professor of international relations at the University of Macau. “What I think we are actually seeing is Myanmar returning to its traditional posture of non-alignment, and I think in that sense we can see continuity with its joining the Association of Southeast Asian Nations in 1997,” Chow said. The professor said he disagrees with arguments that, with reforms that began in 2011, Myanmar has moved to reduce its dependence on China so as to align with the United States against China as part of its encirclement strategy. Myanmar is diversifying its diplomatic options, but China will remain vital to the fate of the emerging state, the professor added. “Myanmar needs Chinese investment and trade. 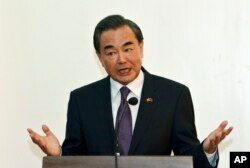 China desires access to Myanmar for its natural resources and access to the Indian Ocean,” as an alternative route for China to import Middle Eastern oil, Chow said. But in return, China also needs to address Myanmar’s concerns by encouraging its companies to ensure a positive social impact there. A number of China’s large-scale resource extraction and infrastructure projects, such the Shwe gas project, are seen to have harmed the environment in Myanmar and its people’s health and livelihoods. Aung San Suu Kyi, in addition, needs China to mediate cease-fire agreements among several of its largest militias including the United Wa State Army and the Kokang-led Myanmar National Democratic Alliance Army, which do business with Yunnan in renminbi and speak Chinese. “The Wa State is currently the biggest ethnic minority militia in Myanmar, which has closer ties to China [than to the rest of Myanmar] — a fact that Aung San Suu Kyi simply can’t overlook,” said Chao Chung-chi, an associate professor of Southeast Asian studies at National Chi Nan University in central Taiwan. “So, even if the West wishes to use her to contain Chinese influence, she will have to think twice,” he added. China’s economic importance in Myanmar may eventually outweigh that of the West. But Myanmar will still look to the West to promote democracy at home, said Liang Jinyun, a professor of political science at Yunnan Police College. “The West plays a bigger role in facilitating [Myanmar’s] democratization while China is key [to foster its] economic benefits and proximity [advantages],” he said.